"WHAT A DIFFERENCE A DECADE MAKES..."
"KUNG HEI FAT CHOI! (Happy Chinese New Year!)" In 1942 among the reinforcements being sent from Germany to Erwin Rommel’s ‘Afrika Korps’ in their assault towards the Suez Canal was a full brigade of Luftwaffe paratroopers (Fallschirmjagers) under the command of General Hermann-Bernhard RAMCKE. These crack troops (almost 3,000 strong) were attached to the Italian 25th Infantry Division ‘Bologna’ and fought at the Battle of El Alamein. Although incurring heavy losses and surrounded on all sides they managed to break out and capture a huge British supply column. In addition to looting all the much-needed supplies they also utilized the captured vehicles to transport the Brigade’s survivors back to the safety of the Axis lines. Throughout their service in North Afrika Ramcke’s men were famous for their audacious and bold fighting abilities… often against heavy odds. Their famous and well-deserved reputation and recognition was as much recognized and admired by their British enemy as well as their fellow Afrika Korps comrades. This is the first of two releases of General Ramcke’s men… in action! AK120 "The Fire Support Team (2-man set)"
As one lying prone MG34 gunner, keeps the enemy’s heads down his ‘spotter’ (with the binos and pistol) observes the ‘fall of shot’. This white-capped FJ officer receives the latest orders from H.Q. via his field telephone. 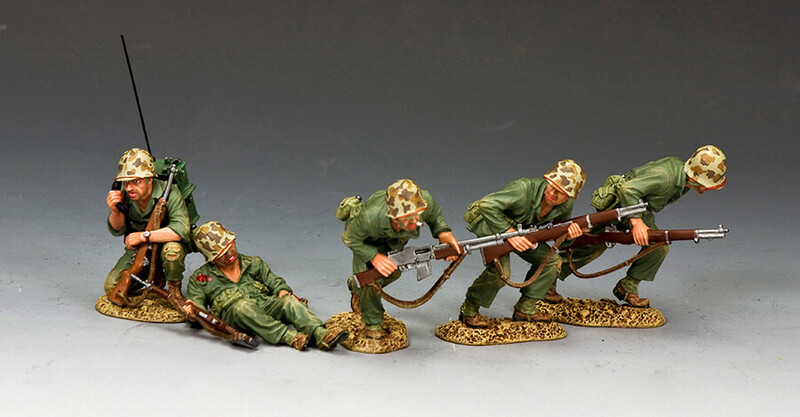 In any ‘action’ collection a rifleman in this position is a ‘must have’! Almost as important and invaluable as the figure above is the standing rifleman... Both men are armed with the standard Mauser K98 carbine / rifle. This MP-40 ‘Schmeisser’ – armed Paratrooper is already a veteran of airborne campaigns in Holland, Belgium and Crete... He’s tough, battle-hardened and experienced... Hence he gets the Schmeisser. AK-S01 "Ramcke’s Boys The Value-Added Set"
Buy all of these singles together and you make a fair saving costwise! Leni Riefenstahl (1902-2003) was, to say the least, ambitious and talented. In her long and varied career she was a film director, producer, screenwriter, editor, actress, dancer and photographer. She excelled in all of them. “Triumph of the Will” (1935) and “Olympia” (1936)… Both important NAZI propaganda films depicting the 1934 Party Rally in Nuremberg and the 1936 Olympic Games held in Berlin. Her technical and innovative mastery of film techniques was second-to-none and both motion pictures received much praise not just inside the Third Reich but also far and wide outside it! Because of her close involvement with the Nazis before and during the war her reputation never fully recovered after 1945 although she continued to work almost up to the time of her death in 2003 at the ripe old age of 101. LAH226 "Leni Riefenstahl film-maker Set"
A casually-dressed Riefenstahl leans over her cameramen during the filming of one of her epic documentaries. In addition to her civilian crew she could and did make full use of additional film crew from Nazi groups such as the SA (Sturmabteilung), Hitler’s brownshirts. Another eager young volunteer from the Hitlerjugend this time assists the Riefenstahl film crew. LAH228X "“Sturmabteilung Minder” (Liaison Officer)"
Although, for the most part, Riefenstahl was left to her own devices because of her extensive use of SA camera crew SA Leader Ernst Rohm insisted that a ‘Liaison Officer’ was always present... at least for the most important ‘shots’ of the Party Rally at Nuremberg that year. 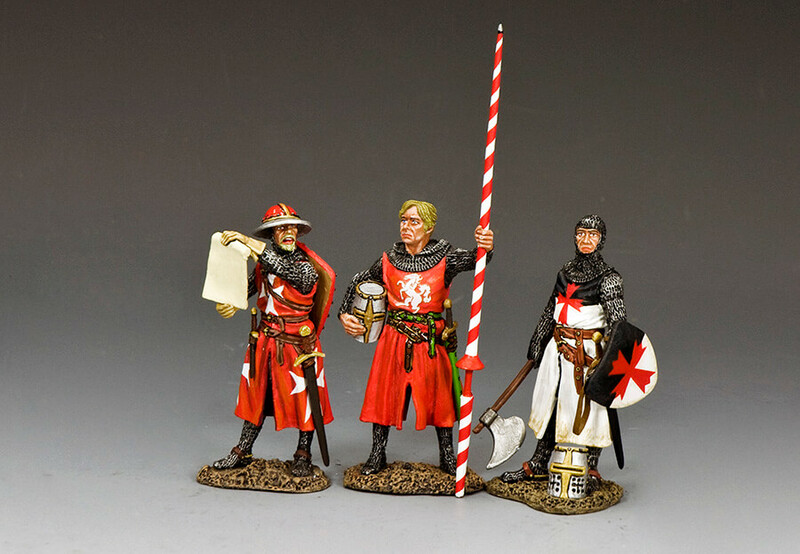 Please Note: This particular figure is a K&C Xclusive available direct through King & Country and certain authorized dealers. LAH229 "Standing Cameraman & Tripod"
Another of Riefenstahl’s many cameramen... This time behind the viewfinder of a tripod-mounted Arriflex... at the time one of the most advanced cine cameras in the world. 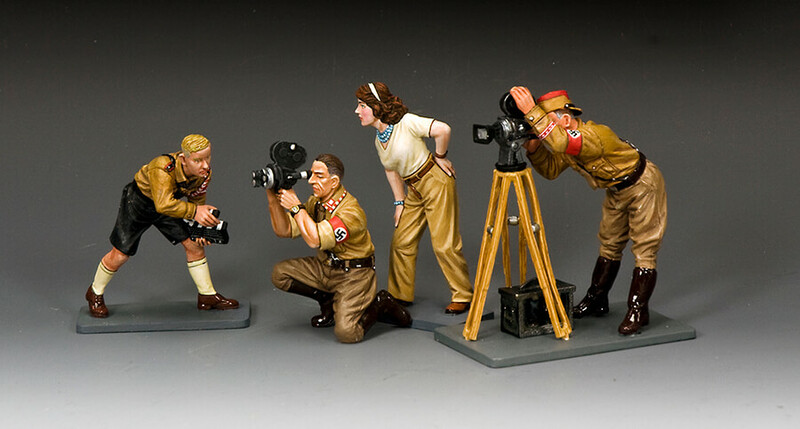 LAH-S01 "The Complete Riefenstahl Set"
Leni Riefenstahl and her complete crew... LAH 226, 227 and 229 all at a very attractive combined value price! 3. "WHAT A DIFFERENCE A DECADE MAKES..."
Just over 10 years later the picture had dramatically changed… The British and Americans were steadily advancing from the West and the Soviet steam roller was smashing all before it from the East. A young Panzer Grenadier cautiously looks around a corner for a likely target... In his hands, the small but deadly ‘Panzerfaust’ anti tank rocket launcher. This 2-man set has the excellent MG42 machine gun lined up and ready to decimate any approaching enemy. This belt-fed machine gun was so well-designed and manufactured that a direct derivation of it is still in use with the German Bundeswehr (Army) today! WH078 "Standing Ready Panzer Grenadier"
A very useful ‘back-up’ figure to support and cover WH076. This figure is doing what Grenadiers do... about to throw a grenade! The ‘Stug III’ assault gun was Germany’s most-produced (over 10,000 vehicles) armoured fighting vehicle of WW2. It was built on the chassis of the already-proven Panzer III tank, replacing the turret with an armoured, fixed superstructure mounting a more powerful gun. Although originally intended as a mobile assault gun to support infantry it was continually modified and improved to become a tank destroyer. Our Ausf. 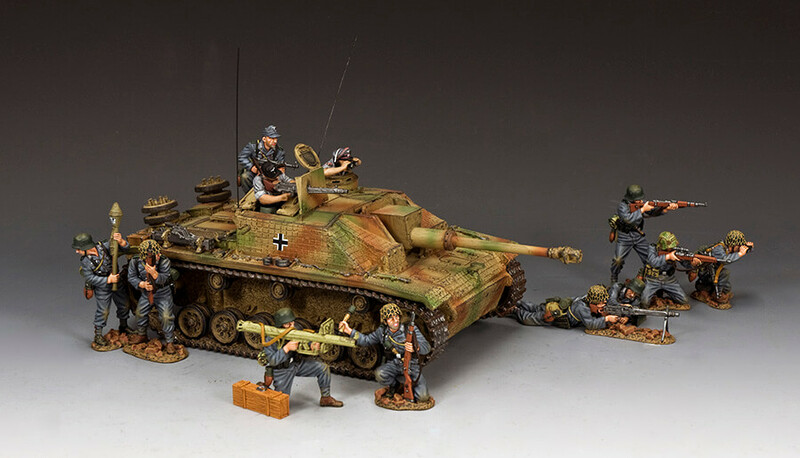 G model is in typical late-war camouflage and mounts a 7.5cm main gun as well as a 7.92 mm MG34 machine gun complete with armoured shield. Two crew figures are provided as well an extra machine gun and shield should the collector wish to display the vehicle in a non-fighting mode. 2 x radio antennas are also attached. WH089 "Dismounted Assault Gun Crew #1"
Two Assault Gun Crew reflecting on some recent action ... As you see one has been wounded while the other enjoys some coffee. WH090 "Dismounted Assault Gun Crew #2"
All three have no bases and can be placed beside or on top of the vehicle. ‘Ivanhoe’ was a novel written by Sir Walter Scott and told the story of one of the few remaining Saxon noble families at a time when medieval England was dominated by Norman nobility, descendants of William the Conqueror. It follows the adventures of Sir Wilfred of Ivanhoe, who has been disowned by his father for his allegiance to the Norman King Richard the Lionheart. After the failure of the Third Crusade many of the Knights (including Ivanhoe) who had followed Richard to the Holy Land returned home. There they found a land under the cruel hand of the King’s brother, Prince John. The novel tells the story of Ivanhoe’s return and his struggle to regain his father’s trust, help a Jewish merchant and his daughter and win the hand of his true love, the Lady Rowena. Along the way there are battles, jousts and duels that Ivanhoe undertakes and wins before he reunites with his father, defeats his enemies and gains the lovely Rowena. Our Ivanhoe stand four-square holding his helmet in one hand and his jousting lance in the other. MK175 "The Templar (Sir Brian de Bois Guilbert)"
A friend of Prince John and a leader of the Knights Templar. In both Scott’s novel and the movies based on it de Bois Guilbert is Ivanhoe’s sworn enemy. He is also in love with Rebecca the daughter of the Jewish merchant, Isaac of York. In medieval times when most of the population were illiterate it fell upon one man, ‘The Proclaimer’ to make all kinds of public statements, news and laws available to the general public. Here the duty has fallen to a “Knight Hospitaller”, easily recognized by the white Maltese cross on a red background on both his surcoat and shield. Keeping his head down this ‘Leatherneck’ makes his way forward under heavy and sustained enemy fire! Clutching his heavy but reliable B.A.R. (Browning Automatic Rifle) another Marine moves rapidly forward. 6. "KUNG HEI FAT CHOI! (HAPPY CHINESE NEW YEAR!)" 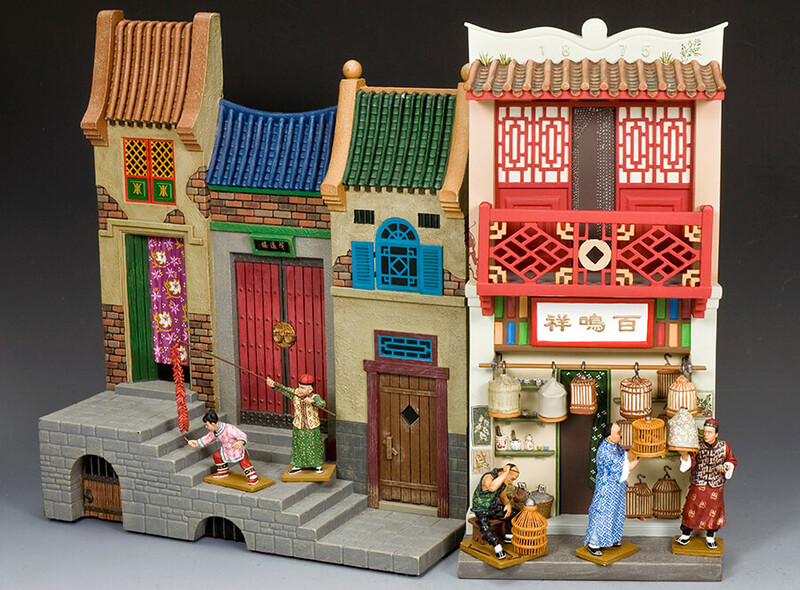 HK273G "Children Firing Firecracker (Gloss)"
The sound of firecrackers is a familiar sound around Chinese New Year... Here a young girl lights the fuse while her elder brother holds the stick and string of fireworks. HK273M "Children Firing Firecracker (Matt)"
Even today in Hong Kong you can still see people taking their pet birds for some fresh air early in the morning. Often a group of owners, usually men, can be seen sitting in local parks discussing their pets, listening to their birdsong and comparing each other’s winged companions. HK276G "The Bird Shop Owner (Gloss)"
Here he is comparing the quality of different cages. HK276M "The Bird Shop Owner (Matt)"
HK277G "The Bird Cage Maker (Gloss)"
Some ‘Bird Shops’ would employ their own artisan craftsman to hand-make each cage individually to each owner’s specific requirements. HK277M "The Bird Cage Maker (Matt)"
“Pappy” Boyington was well-known for his “salty” language and sense of humour and irreverent attitude to authority… This little squadron sign personifies it! AG016 "The Army of Darius Officer"
A standing figure of one of Greece’s most legendary warriors and the man who thought up the idea of the “Wooden Horse of Troy” and brought an end to the ten-year long Trojan War. AK095 "2cm Flak 38 Gun Set"
A little 2-man “add-on” set for the Flak Gun… a loader and spotter, both Afrika Korps. A greatcoat-clad Medic tends to the leg wound of a sitting GI. DD281 "Tank Crews Set #2"
Another two dismounted “Tankers” take a break to eat some chow and stretch their legs. Between 1914 and 1918 over 10,000 regular and reserve members of Queen Alexandra’s Imperial Military Nursing Service were at work in France, the Middle East, Italy, East Africa and India. Wherever they went they were easily recognized by their grey and white uniforms and scarlet red capes. This nurse is typical. LAH152 "SA Man Marching w/ Rifle"
Another spectator listening to John’s preaching. On her way back from the water well this woman sits and listens to words of John. Seated on a colourful mat this young man is studying. Hundreds of these large metal supply containers were dropped all over Arnhem...Alas, many fell into German hands...Those that did land safely contained extra weapons and ammunition as well as food and medical supplies. And that’s the story for January … Hope you had a great Christmas and we’ll see you again in, if I remember correctly, February.